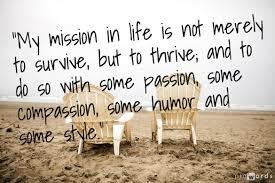 What is your life’s mission? Maybe your laughing and saying ‘to win the lottery so I can retire’, or ‘ I can’t wait till the kids grow up, so I can get some peace around here’! Whatever answer comes to your mind, I’m sure it will be something over the top. It is great to joke and fantasize about what we would like to be doing with our life. Often the reality is, what we are doing isn’t always what we want to be doing. The state of things as they actually exist, is real life. What we experience, whether it be good or problematic is fact. Reality is actuality, even if we don’t like it. But, there are times when we are able to escape what is tangible and go out on a limb. These are times when we get to feel like a kid again. Even if it is just going barefoot in the rain. Whatever your mission is in life, it shouldn’t weigh you down. Having an expedited journey is all about following the path to your Higher Calling. Getting closer to your life’s purpose is workable, if you have a little faith and courage. There is nothing wrong with being a Warrior, actually every good champion needs a mission. What would be the purpose of being a brave combatant if there was no workable expedition. There is a fighter in all of us, all we have to do is dig deep inside. So laugh out loud, and don’t be afraid to ask for the stars and the moon, no mission is to large for the Warrior in you.